Yes, a bottle from the very beginning of Bowmore’s dark period in the 1980s (see here for my thoughts about all of that and for a review of an underwhelming official bottling from the tail end of the decade). This is from a mysterious outfit called Prime Malt who seem to have only operated in the US. Michael Kravitz has more information about them in the fourth paragraph of his review of this same whisky and also in the comments (he got his sample from the same source: Florin who comments often on both our blogs). This one was billed as “Prime Malt Selection No. 4”; I’m not sure how many selections there were from this bottler/label. The last 1982 I tasted–(also) from Duncan Taylor–had the notorious soap on the palate and finish but no real offensive perfumed notes. Will this one be any better or worse? Nose: Some minerally peat and paraffin and some bitter citrus (grapefruit). After a few minutes there’s some mild tropical fruity notes–melon and maybe some guava. There’s a pepperiness mixed in with the fruit and it gets a little more floral after a bit too. I am detecting a tiny soapy note, but it’s not overbearing. With more time that combination of peat, paraffin and peppery grapefruit gets more acidic. Fifteen minutes later there’s a malty/sweaty thing and some creamy vanilla but that peppery paraffin thing never goes away. Hmmm the nose seems to improve with water, becoming softer (the bitter/peppery citrus recedes); but a little later the sweaty note intensifies and the soap’s back as well. Palate: Soft texture. First some sweet peat, then some lemon, then some soap and then a nice hit of musky fruit. Yes, there’s soap but it’s transitory and not overbearing. It does get a little bit stronger with time but there’s a wet stone/minerally aspect to it (maybe someone soaping themselves upstream from you in a mountain brook?). Okay, after a few more sips and a lot more minutes the soapiness is taking center stage. Somewhere between soap and cheap face-lotion, actually–I guess, glycerine is what I mean. Not nice. What will water do? Well, the glycerine recedes a little bit, which is good. More floral certainly but I like the Bowmore lavender. Finish: Medium. The musky fruit lingers, along with the pepper, but the soapy note is at its strongest here (though not terribly strong again). The finish is also where the peat is most apparent–a mild ashiness lingers on the side of the palate. The soap gets much stronger on the finish with water. Comments: On those nose this was quite reminiscent of this Hart Bros. Littlemill 20 I reviewed some months ago. I didn’t care overmuch for that one (though I haven’t gone back to it in a while) and I ended up liking this one even less. A pity–it started out in the mid-high 80s and then went downhill fast. I guess the lesson is to drink it down quickly before it can “develop”. Unlike Michael, I didn’t think water was particularly disastrous for this, at least on the nose and palate–it seemed to balance the palate a little (I really don’t care for that paraffin/fruit combo and water did away with that at least). I do suspect I added a lot more water than he did (closer to a splash than a few drops). Still, I think he might have liked it more on the whole. Rating: 75 points (but drink it fast). 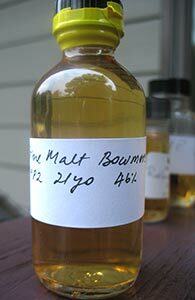 This entry was posted in -Whisky by Rating, 75-79 points, Bowmore, Prime Malt, Whisky by Bottler. Bookmark the permalink. Yeah, no kidding about drinking it fast. This one starts so well. As you mentioned, I did only add only few drops of water. You’re probably right that more water could have adjusted the big soapy thing. Yeah, that Guid Scotch Drink review seems like it’s of an entirely different whisky. But it seems to be by a she not a he. And I’ve said this before, but I think those of us in the US should consider splits of a large number of those intriguing but unreviewed indies still floating around. There are all those Scott’s Selections for instance that I am constantly tempted by (the Bladnoch, the Littlemill, the Aberlour etc.) but pass on because I don’t want to risk $150 for a full bottle. But if I was only going in for a fourth or fifth I’d be all for it. Oh you’re right. I thought Jason did all the reviews there. I’m with you on the Scott’s Selection bottles that seem to be floating around here and there. I’ve tried the Aberlour and really liked it, but I feel like I’m alone on my preference for bourbon oak Aberlour characteristics. That one in particular is loaded with honey and sweet fruits. It won’t tax anyone’s vocabulary or expanded anyone’s minds, but it’s a swell drinker. In short, you can count me in on splitting some of these. Now I know what FWP is – and I don’t want to taste it again! I think you described it well – glycerin, soap, face lotion. I’m certainly drinking stuff that belongs to a bathroom, and that’s not meant to be drunk. There’s something very sweet and full of artificial pink flavor – like a Nesquik strawberry powder, or Kras Yugoslavian bubble gum cigarettes, circa 1978 (you know what I’m talking about). The peat helps, but alas, not enough. Thankfully, the finish is quick. Bowmore survived through a decade of this crap? Good bottle – for historical and educational purposes, only. This should come with a warning and instructions in case of accidental ingestion. An Islay bubble bath, perhaps?